A 30-year-old orca whale has died after a brief illness at SeaWorld Orlando, the park announced on Monday. Kayla, who was born in captivity in Texas in 1988, was one of 20 whales still housed at the company's parks. 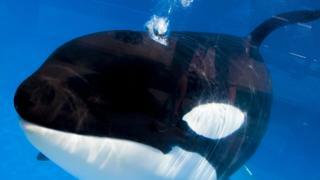 SeaWorld said Kayla's condition had deteriorated on Sunday after she showed signs of illness on Saturday. "Although animal care specialists and veterinarians devoted around the clock attention to Kayla, she did not survive," it said. "While today is a difficult day for all of us at SeaWorld, Kayla inspired generations of guests and employees to care and learn more about this amazing species." The whale's cause of death is still unknown, pending a post-mortem. Can orcas ever be healthy in captivity? The US government estimates that female orcas typically live around 50 years, but can live to be as old as 80 or 90 in the wild. Animal rights groups have long argued that those in captivity have a far shorter life expectancy. SeaWorld has faced growing pressure over its killer whale programme since it became the focus of a documentary, Blackfish, in 2013. The film criticised the park's captivity practices and suggested they were putting their trainers, who used to perform in live shows with the animals, at risk. Facing a backlash over the film, the company announced an end to its controversial breeding programme in March 2016. It has also said it will phase out all theatrical shows involving whales at its parks. Kayla was born in captivity in 1988 in San Antonio, before being transferred to SeaWorld Ohio, which has now closed, in 1991. She was eventually returned to San Antonio, where she gave birth to a calf named Halyn in 2005. After rejecting her calf, Kayla was sent to Orlando in 2006. Halyn died in 2008, aged two. In a series of tweets, People for the Ethical Treatment of Animals (Peta) paid tribute to Kayla, and said her "suffering has come to an end" after a life in captivity. BREAKING: Kayla, an orca trapped at #SeaWorld her entire life, has DIED in a tank at the #Orlando abusement park. She never got to swim in the ocean. The group plans to hold two memorials for the whale outside the Orlando park this week to call attention to other orcas still held there. Kayla is the fourth orca to die at SeaWorld since the start of 2017.